A landlord in Calgary is out $8,000 after trying to give her tenant, a single mom, a break. Now, the landlord is just hoping she can collect some of what she is owed. Another landlord hasn’t received a single rent payment, but now must store the deadbeat tenant’s possessions for another 30 days. These cases, profiled in a recent story by CBC News, resemble the 8,000 others heard in Alberta last year. While officials say that the dispute resolution system works, they agree there is always room for improvement. Still, landlords feel the system is stacked against them, and tenants quickly learn how to play that to their advantage. Landlord Bill Biko has been through it all, and now offers tips and resources to other landlords in Alberta in order to help them survive the eviction process. “It’s a recurring theme, but the majority of landlords who contact me with problem tenants have given tenants the benefit of the doubt and at least one break if not more. If you are a relatively new landlord, this is the quickest path you can take to wanting out of the landlording business,” he explains. That’s a far cry from losing $8,000. Properly document all aspects of the tenancy in order to prove the case against the tenant. A landlord in British Columbia recently lost his bid for a monetary award against a problem tenant who damaged the rental unit. While the dispute resolution officer agreed that the tenant did cause considerable damage, the landlord could not recover a dime because the landlord’s itemization of damages was not substantiated by receipts. It is also crucial to hold bad tenants accountable and take steps to collect what is owed. Otherwise, the tenants will take advantage of the next landlord, and the next. TVS members can report tenant pay habits each month. This serves as an incentive to tenants who don’t want to tarnish their rental history. If the next landlord checks past landlord references and runs a credit report, this will minimize the likelihood of inheriting someone else’s problem tenant. And that can save a landlord a lot of money. Bill Biko is an experienced landlord dedicated to helping other landlords understand the eviction process in Alberta. 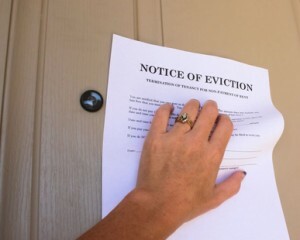 Visit his website, http://www.albertaeviction.com/, for more information, including the Alberta Landlord Eviction Guide, eviction notice forms, and tips. I recently lost a case against a tenant – That tenant horseplayed with his girlfriend in the elevator in the wee hours – caused it to stop and resulted in a call out charge plus repairs amounting to about $1,800. Even though the incident was photographed by the elevator’s camera, the dispute resolution officer ruled that evidence was insufficient to prove that the elevator stoppage occurred before or after the horseplay. In fact the tenant had already been caught by the camera two times previously in similar incidents, but the evidence was similarly insufficient. The strata has since installed videotaping cameras but I’m not sure whether this is capable of capturing proof of causation because the videotape may still be unable to show when the elevator stops without an external reference point for the elevator’s movement. Any advice? PS: Fortunately I was finally able to evict the tenant, not by the formal eviction process, but by constantly bugging him with phone calls and emails.